This month I’ve prepared a special classics Jonas Steur Tribute CDMIX. It features many of his own productions, remixes and collaborations with other artists, but also some of his side projects like Fable or Estuera. Thanks to the permission by Jonas Steur I’m allowed to make this mix available for everyone! Enjoy! Tic Tac Trance #093 Replay available! 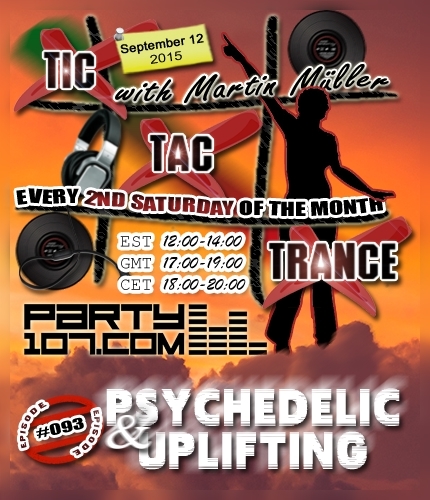 Tic Tac Trance returns on September 12 2015 with episode #093 on Party107.com. You can expect for this show a 2 hours uplifting & psychedelic underground trance mix which features tunes of labels like Go On Air, Future Sound of Egypt, Pharmacy Music, Outburst, Molekular and many, many more! Make sure to tune in!